By day, Nine Dragons takes on a more contemporary feel as the sunlight softens the darker wooden elements in the restaurant, and the subtle modern day China color palate is more visible. 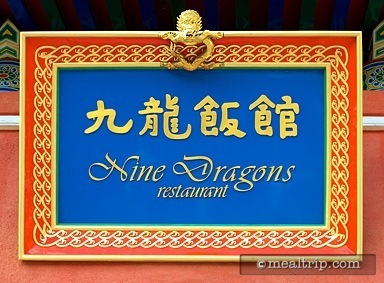 The lunch menu at Nine Dragons is very similar to the dinner menu, offering slightly smaller prices for slightly smaller portions. Hot and cold appetizers are available, along with entrees that range from Peppery Shrimp with Spinach Noodles and Sweet and Sour Pork to Fragrant Five-Spiced Fish and their very own “Nine Dragons Fried Rice”. About the only thing missing from the lunch menu is the Zha Jiang Noodles Sampler, you’ll have to go to diner to find that on the menu. A few dessert options are available, such as strawberry ice cream and traditional coconut rice pudding. Standard beverage offerings are available along with a few imported beers, and there are even some far eastern-ish options such as the blackberry-jasmine iced tea, various fruit smoothies, and iced chai tea.